CALGARY, Alta. – Mike Babcock will return to international competition in September as the Team Canada head coach at the World Cup of Hockey. Mike Babcock is the first and only coach to join the IIHF Triple Gold Club, having won an IIHF World Championship (2004), a Stanley Cup (2008), and two Olympic gold medals (2010, 2014). His international success also extends to the IIHF World Junior Championship, which he coached Canada to gold in 1997. Currently in his first season as head coach of the Toronto Maple Leafs, Babcock spent the 10 previous NHL seasons as head coach of the Detroit Red Wings, where he was a finalist for the Jack Adams Award in 2008, and named the Sporting News’ NHL Coach of the Year that same year. His NHL coaching career began in Anaheim in 2002, where he led the Ducks to the Stanley Cup Final in 2003. Claude Julien (Orleans, Ont./Boston, NHL) was part of Babcock’s coaching staff when Canada’s National Men’s Team won its second consecutive Olympic gold medal at the 2014 Olympic Winter Games in Sochi. Julien was assistant coach of Canada’s bronze medal-winning National Junior Team at the 2000 IIHF World Junior Championship, and he served under Renney at the 1999 IIHF World Junior Championship where the team took home silver. Julien is in his eighth season as head coach of the Boston Bruins, leading them to a Stanley Cup in 2011 and into the Stanley Cup Final in 2013. He won the Jack Adams Award as the NHL coach of the year in 2008-09, also earning NHL Coach of the Year from The Sporting News. Julien’s career has included head coaching positions with the NHL’s Montreal Canadiens and New Jersey Devils. Barry Trotz (Dauphin, Man./Washington, NHL) has served as an assistant coach for Canada’s National Men’s Team at the IIHF World Championship on four occasions – 2002, 2003, 2009, and 2013 – delivering one silver (2009) and one gold (2003) for Canada. Following a long stint as head coach of the Nashville Predators that included being named The Sporting News’ NHL Coach of the Year in 2007 – the same year he served as assistant coach at the 2007 NHL All-Star Game and finished fourth in balloting for the Jack Adams Award – Trotz joined the Washington Capitals in 2014 as head coach. Joel Quenneville (Windsor, Ont./Chicago, NHL) is fresh off his team’s most recent Stanley Cup win. Quenneville, who is in his eighth season with the Chicago Blackhawks, has led the team to three Stanley Cup championships in seven playoff appearances. For Quenneville, the World Cup of Hockey marks a return to international competition; he was named as head coach for Canada’s National Men’s Team at the 2004 IIHF World Championship, but had to step down for health reasons and was replaced by Babcock. Quenneville received the Jack Adams Award while with the St. Louis Blues in 1999-2000. In addition to the Blackhawks and Blues, Quenneville’s NHL resume includes assistant coaching positions with the Quebec Nordiques and Colorado Avalanche. Bill Peters (Three Hills, Alta./Carolina, NHL) is coming off a role as assistant coach of Canada’s National Men’s Team that won gold at the 2015 IIHF World Championship last spring. Peters’ international hardware also includes a gold medal from the 2008 Memorial of Ivan Hlinka Tournament where he was head coach of Canada’s National Men’s Summer Under-18 Team, and a silver medal as an assistant coach with Team Pacific at the 2005 World Under-17 Hockey Challenge. He is in his second season as head coach of the NHL’s Carolina Hurricanes, and previously spent three seasons as an assistant coach with the Detroit Red Wings under Babcock. 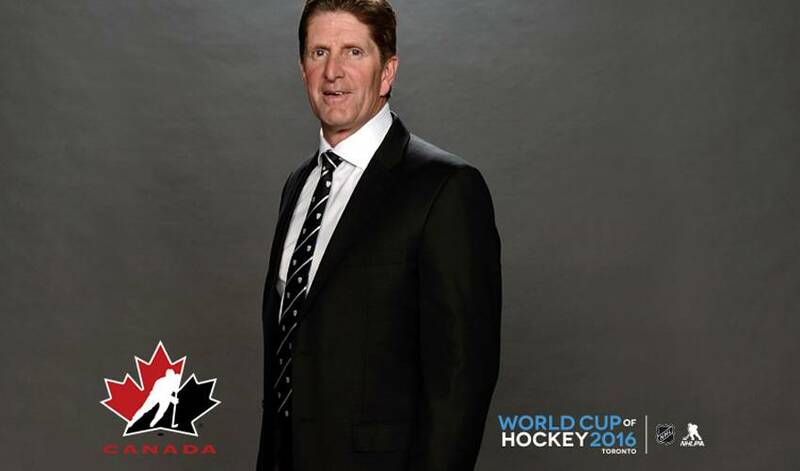 In June, Hockey Canada announced the Team Canada management group for the World Cup of Hockey comprised of Armstrong (Sarnia, Ont./St. Louis, NHL) as general manager, with assistance from Marc Bergevin (Montreal/Montreal, NHL), Rob Blake (Simcoe, Ont./Los Angeles, NHL), Ken Holland (Vernon, B.C./Detroit, NHL), Bob Murray (Kingston, Ont./Anaheim, NHL), and Scott Salmond (Creston, B.C. ), Hockey Canada’s vice-president of hockey operations and national teams. Renney, as president and CEO of Hockey Canada, and Scott Smith, the organization’s chief operating officer, round out Team Canada’s World Cup of Hockey management group. A select number of tickets for the event will go on sale to the public Thursday, Nov. 12 at Ticketmaster.ca. The World Cup of Hockey returns in September 2016 in Toronto, where eight teams, comprised of the world's best hockey players, will compete for a best-on-best international hockey championship. The World Cup of Hockey is a joint effort of the NHLPA and the NHL, in cooperation with the International Ice Hockey Federation (IIHF). It is expected that more than 150 of the best players in the NHL will participate in this tournament. For more information on Canada’s National Men’s Team, please visit www.hockeycanada.ca, or follow along via social media at www.facebook.com/hockeycanada, www.twitter.com/hockeycanada and www.twitter.com/hc_men.